Billy Graham has one last message for America. It is a message of hope and encouragement. In November of this year, millions around the world will listen to this message of hope. We invite you to join us for this outstanding evening together with others in need of encouragement. 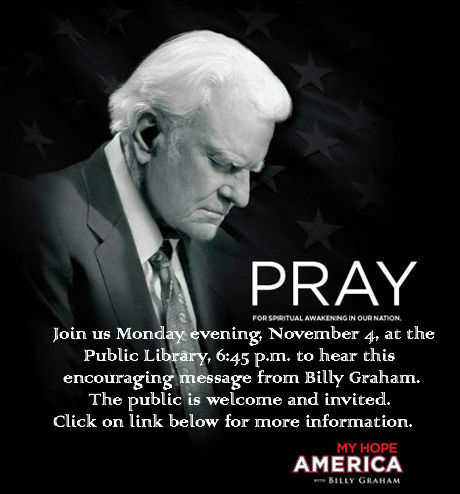 Billy Graham's message will be shown at the Public Library, on Baxter Street, at 6:45 p.m. on Monday evening, November 4. There is no admission price and the public is invited. Come and find hope for your life and family through the message of Billy Graham. Central Presbyterian Church will provide refreshments and serve as the host for this evening with the world's foremost preacher and most respected personality.